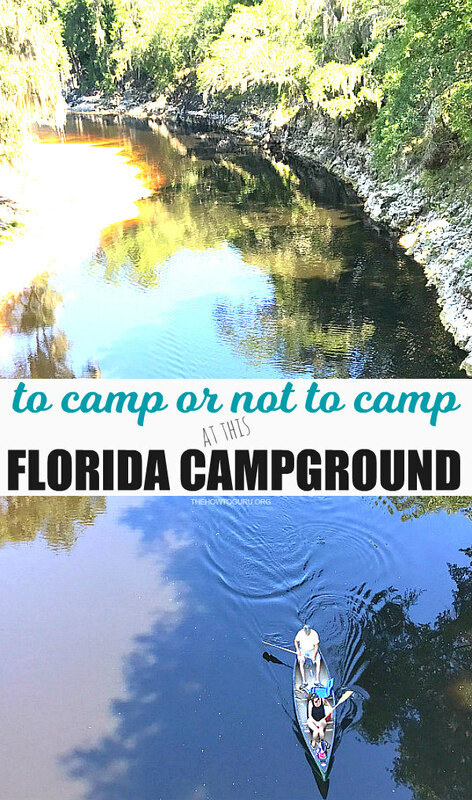 Florida Campground: How To Enjoy This Spot Even If You Are Scared To Death! I love sharing travel reviews of luxury resort hotels, beach cottages, camping and Disney tips in the South. Many of you express how you like to “live through us” on our trips to see if it’s a good vacay choice for your own people. 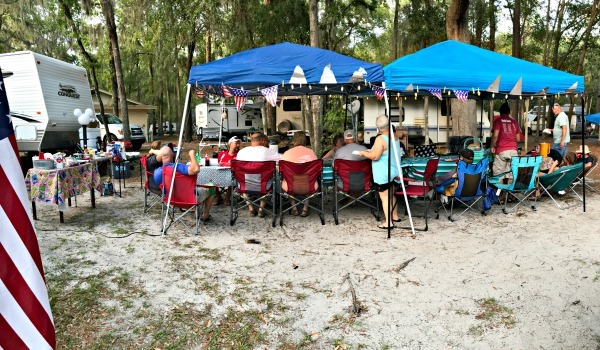 Today’s Florida campground review of one camping spot where we thought we might be “meeting our maker” may have you booking a Florida campsite right away or have you vowing to never put it on the bucket list. You decide as you keep reading about good, the bad and the ugly! 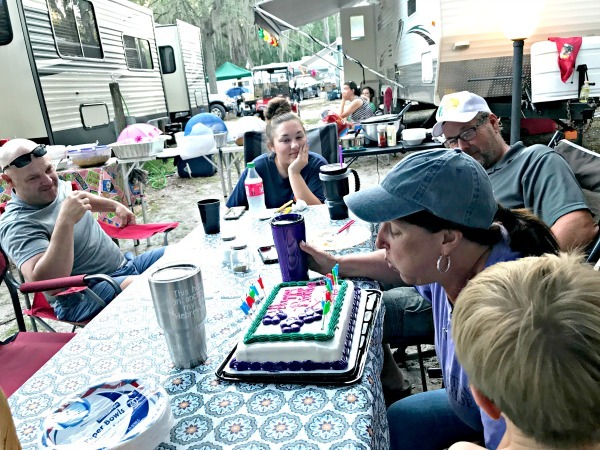 Friends invited us to join them at a North Florida campground called Spirit of the Suwannee Music Park for a long holiday weekend. We’ve stayed at RV campgrounds with them several times so they knew that we love golf cart trails. 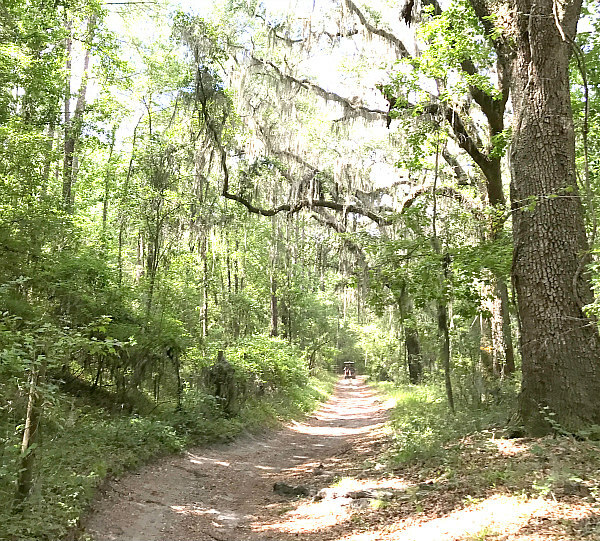 My friend Becky told me that they’d stayed at the Suwannee Campground before and loved the miles of trails that are available for campers. I told her I would check it out online and then talk to the hubs. 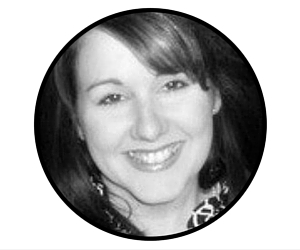 I’m a travel writer and travel research is what I do. But for the life of me, images and videos about this place were nonexistent. Their website has literally no pictures of campsites – RV or primitive. The Youtube nor the Facebook page had campsite info either – just images and videos about concerts like this and this. I quickly realized from their site address (music lives here dot com) and FB that it’s all about the music. I just wanted to go camping at a relaxing, woodsy Florida campground, though, not go to concerts, so I called my friend about my concerns. She assured me that we would be going on a weekend without a big music event scheduled. She was absolutely right, we weren’t affected by loud music at all during our stay. We loved the way the campground seemed to be tucked into the Florida forest. However, Superman was not impressed with how tiny our RV campsite was. There are campsites for tents, RV, and horse camping facilities as well. Insider tips: Do not book online because there isn’t a clear view of the sites. Call to and talk to them to book your campsite so that you can make sure it is big enough. Our group of friends was ready to go golf cart riding as soon as we finished setting up camp. We rode trails for a while and then ended up at Suwanee (Sulphur) Springs. Yes, it smelled slightly of Sulphur but the view was incredible. Inside the man-made limestone wall was a pool of the clearest blue-green water. 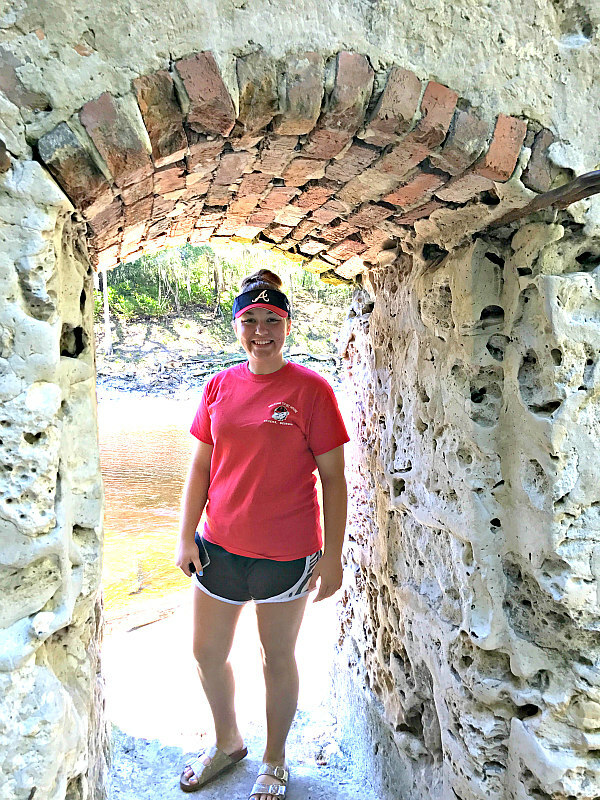 The fifteen feet high and three feet thick wall was built in the 1800s. 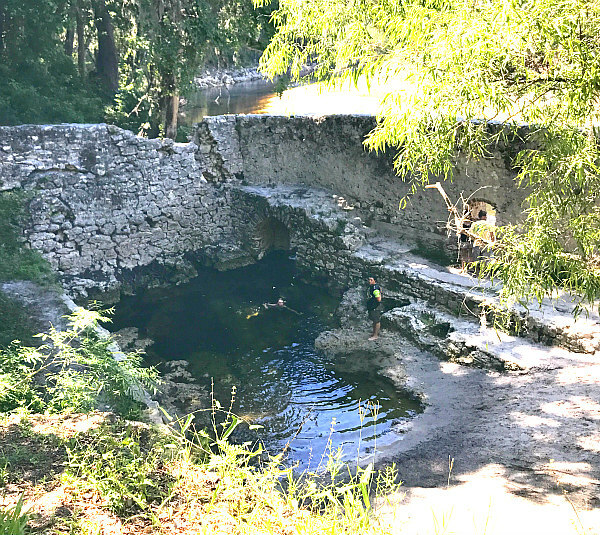 This Suwannee River Water Management District allows visitors to swim and picnic here. It used to be a popular vacation spot back in the day when folks thought these springs had healing powers. A hotel and cottages were built and bottled spring water was sold from this spot. Every historic place has a story just like you and I do. Insider tips: Bring your camera for cool photo ops with the family but be careful! We didn’t bring our bikes on this trip but there were many people riding them around. We spent most of our time riding the 20 + miles of trails within the campground and the surrounding area on our carts. So much fun! There are golf cart rentals available at the campground. You’ll see in the video below the variety of trails that are available. 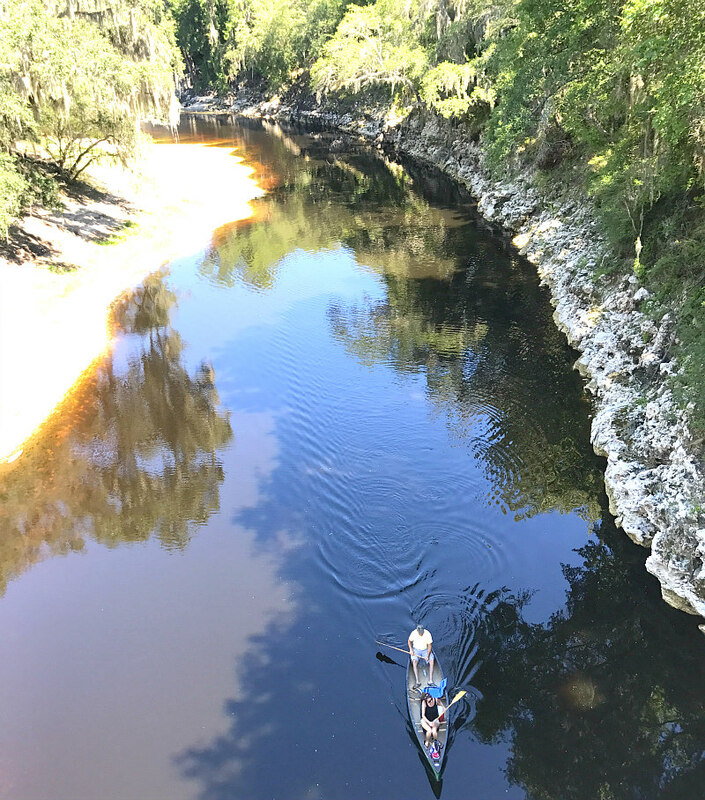 On day #2 of the camping trip, our group wanted to canoe and kayak down the Suwannee River. Although not owned by the campground, the Canoe Outpost that rents all of the equipment is so close that we rode to it on our golf carts. After renting our equipment, it was loaded on a trailer behind what looked like a Scooby Doo van. We were told that a driver would take us four miles upriver to an access and we would end up back in this spot. We all packed into the 15-passenger van like sardines. The driver gets in and starts giving instructions. He didn’t turn the van on right away and several in our group were giving him a hard time about getting that air conditioner going. He didn’t acknowledge their jokes and showed no emotion whatsoever as he continued his short speech. The driver finally turns the air on and heads down the highway. When he turns onto a one-lane “path” through the woods, it’s as if he thinks the cops are chasing him. He floors it. I mean, he literally has his foot all the way to the floorboard and he never slows down even though we are hitting bumps and sharp curves and bouncing all around. At first it was like he was trying to make us laugh or shock us. I kept waiting for him to slow down and say something funny. He never smiled, laughed, or acted like this was abnormal in the least. As you’ll see in the video, it was the ride of our life. My thrill-seeking daughter thought it was awesome, I was terrified when we almost hit an oak tree, and the hubs was pretty aggravated that the fella that wouldn’t slow down. Insider tips: If you want to add some excitement to your prayer life, ask for the short, dark headed young fella to drive you to your river spot (if he isn’t fired by now)! Our group chose the four-mile/two-hour trip. Honestly, it took us way more than two hours but we weren’t in any hurry. The daredevils in our group kept stopping to jump off of cliffs and swing on the ropes that hung over the water! The hubs and I were in a canoe while our girl had her own kayak. She was in heaven! 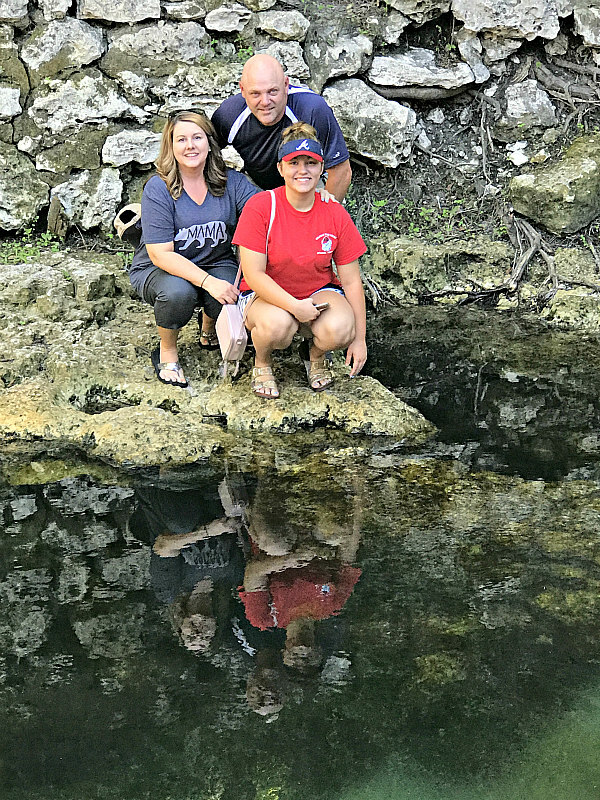 We all meandered down the tea-colored, clear waters with limestone cliffs on each side. Fortunately no one in our group saw snakes or alligators (one of my fears). 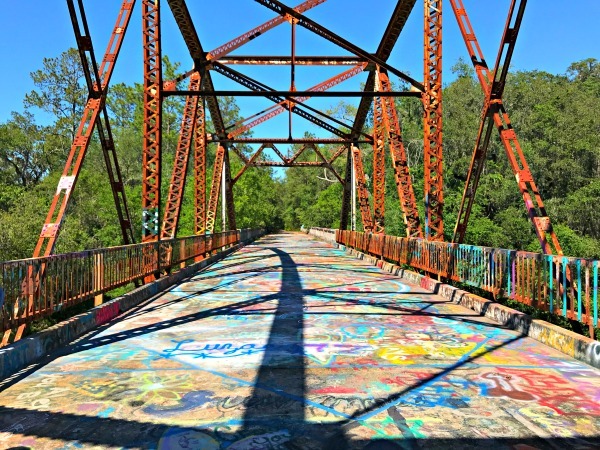 Just around the corner, our friends showed us an old bridge that’s no longer used for cars but is apparently used for artistic expression. Insider tips: Bring only the essentials in a waterproof bag. Show up for your excursion with sunscreen already applied and bring extra. Wear flip flops or some type of beach shoe (we saw a young fella cut his foot on rocks in the river when he got out of his kayak). I would suggest choosing only the one-hour trip if you have children. Before you ever get to the trails, it’s fun to ride through this campground on bikes or golf carts because it is so huge. Our campsite was in a woodsy area, but the prettiest section to me were the campsites near the lake. The Country Camp Store was big, clean, and full of anything you could possibly want. The ice cream hut made lots of money on our crew too. Our favorite group ritual was definitely eating supper together at one camp spot, visiting the bat house at dusk, and then riding the carts until late. Yes, I said bat house. Out in a large clearing on the property is a tall bat house where the bats come flying out for their nocturnal adventures. It was creepy but fun to see them – definitely a kid-pleasing event. Spirit of the Suwannee now holds many memories (most of them good) with our family and friends. 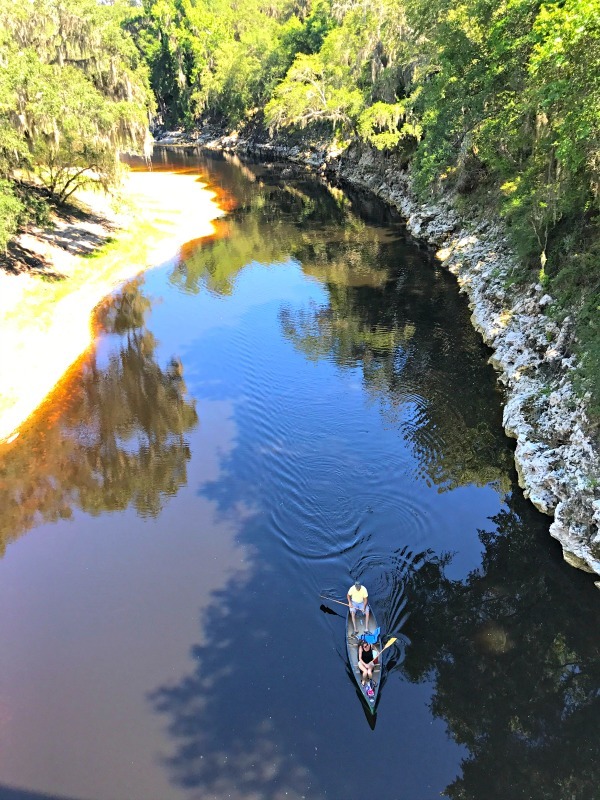 To date, this North Florida Campground has the best trails of any that we’ve visited in our 12 years of camping. If we get the chance to return, we will definitely call to make our reservation to ensure that we get a bigger site. I hope I can talk the hubs into camping closer to the lake where the view is better and the sites are large! Take bug spray and sunblock. You can bring your own kayak or canoe but there is still a charge from the outpost is they carry your equipment and you to the right spot. If you bring Fido, he must be on a leash at all times and his business has to be picked up behind him. All sites do not have a grill outside, so ask in case you have to bring your grill like we did. Oh yeah, and the internet was terrible so it’s a good time to “unplug” when you visit. All in all, it was a great trip with amazing friends that kept us on the move – which is what we like. 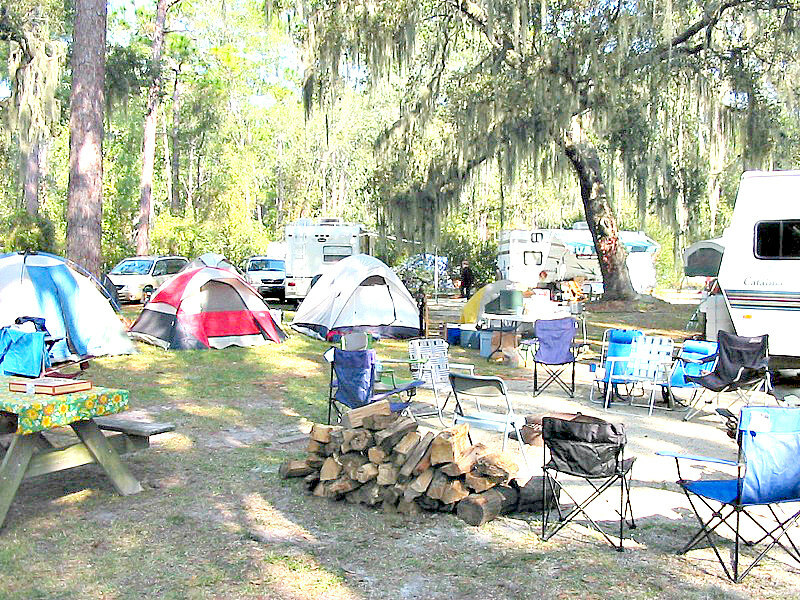 What’s YOUR favorite North Florida Campground? I’d love to hear about it in the comments! Looks like a very fun trip minus the threatening experience! I’ve never been much of a camper – maybe in my retired years!! What a fun weekend! Minus the crazy car ride!! How scary! !